NO EXCUSE NEEDED (GB) (Chestnut 1998-Stud 2003). 4 wins-2 at 2-to 1m, Goodwood Celebration Mile S., Gr.2. Champion NZ Sire of 2YOs 2007-08. Sire of 418 rnrs, 242 wnrs, 18 SW, inc. Daffodil (New Zealand One Thousand Guineas, Gr.1), I Do, No Excuse Maggie, Timy Tyler, Justanexcuse, Take the Rap - St Rap (H.K. ), Grand Dancer, Vincent Mangano, Snow Excuse, Taurus, Under the Sun, Champagne Needed, Santos, Lesley Brook, Masquerade, Mercury Mistress, etc. Miss Tenpins (f. by Pins). 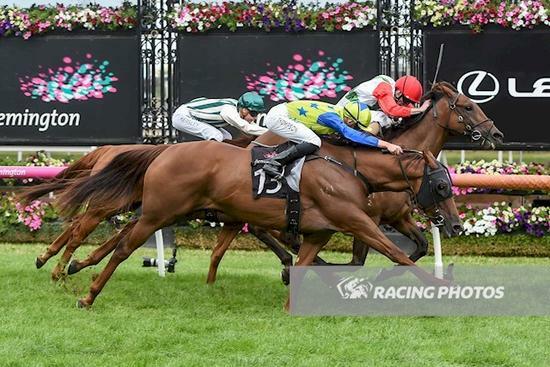 6 wins to 1400m, A$211,625, ATC TAB Place Multi H., Bledisloe Cup Festival H., Red Lea Chickens H., 2d ATC Bacardi Untameable H., Hyland Race Colours H., Tab.com.au H., Cellarbrations H., 3d BRC Bright Shadow H., L, ATC James Boag's Premium H., TAB Quaddie H., Schweppes H., St George Motor Boat Club H.
She Knows (f. by Pins). 3 wins at 1500m, 1600m, WRC Sofia Rosa Cup, 2d Wairarapa Thoroughbred Breeders' S., L, Taranaki RC NZ Bloodstock Insurance Pearl Series H., 3d WRC Platinum Homes Taranaki H.
No Commitment (g. by No Excuse Needed). 4 wins. See below. Lady Provocateur (f. by Pins). 2 wins at 1400m, 1600m, 3d MRC Swettenham Stud H.
Flying Supreme. 6 wins-1 at 2-from 1200m to 1650m, HK$5,736,000, HKJC Suisse Programme H., Choi Ying H., Centurion Restaurant & Bar H., Golden Years H., Tianjin H., The Argonaut H., 2d HKJC Hong Kong International Sale 2008 Challenge, Hong Kong International Sale May Challenge, Cotton Tree H., Tim Mei H., 3d HKJC Chan Trophy H., Buffalo Hill H.
O'just Saying. 3 wins from 1200m to 1600m, HKJC Viva Pataca H., Mediterranean Sea H., Kut Cheong H., 2d HKJC HKU Faculties of Medicine & Engineering H.
Jervois Night. 2 wins at 1300m, 1400m, 2d MVRC Ranvet P., 3d MRC Splashland P.
Blue Swede (O'Reilly). 8 wins from 1200m to 1600m, S$631,402, Singapore TC Kranji A S., Hello Zagreb S., Super Easy S., Novice S., Reunion S., Kranji C S., Class 2 H., 2d Singapore TC Kranji A S.-twice, 3d Singapore TC El Dorado Classic, L, Singapore Gold Cup, L, Kranji S., Charity S., 4th Singapore TC Fortune Bowl, L.
MISSION WELL (Elusive City). 4 wins to 1400m in Macau, Macau Lisboa Prelude, L.
Just Defence. Winner at 2, Rotorua RC Golden Orchid Futurity H.
Bolshoi Star (Three Legs). 4 wins. See above. Our Pal (Bakharoff). 7 wins at 1600m, 1800m, HKJC Wellington H., 3d HKJC Stewards' Cup, L, Hong Kong Derby, L.
HIGH CEE (Marju). 5 wins from 1400m to 2300m, A$315,490, STC Ajax S., Gr.2, Newcastle Gold Cup, Gr.3, NSW Tatt's RC Margaret's Welter H., AJC Spring H., 3d Newcastle JC Newmarket H., Gr.3, STC Selleys Araldite Welter H., 4th STC Rosehill Guineas, Gr.1, VRC Auckland Racing Club H., L.
BOCELLI (Lord Ballina). Horse of the Year, Champion 4YO Classic Male & Triple Crown winner in Singapore in 2001. 9 wins from 1200m to 2000m, £2,000, NZ$5,500, S$1,318,715 in NZ and Singapore, Singapore TC Patrons' Bowl, L, Singapore Derby, L.
Race Record: 12 Starts 4-3-1 A$190,580. 4 wins from 1400m to 2000m, A$190,580, to 2017-18, VRC Singapore TC Trophy H., MRC Robert Taranto H., 2d MRC Le Pine Funerals H.